I am trying to be relaxed, however I am not sure what to say, there is a desire or I feel there is a desire for people to hear me explain some form of save the world philosophy or how I am going to help or what I am doing. I am never sure what to say as I feel presently like just one of thousands of people or organizations here, the place appears full of agencies to help the people of Niger. However that does not mean they have left the Hotel or the Restaurants and are actually out in the areas working, I have met one person that appears to be from the countryside and in the city for a little rest and relaxation, all the others are some acronym related organizations that somehow everyone assumed I understand. I have been very fortunate and I have been explaining that I have a website and a blog and travel around the world; nobody has asked the name of the website, so I am under the radar. I am going to change my strategy today and say I am a tourist and stop volunteering any information more than they really ask. I believe they will all stop asking quickly so this is good, it does not seem to be a wanted person here the tourist, therefore I can be a tourist easily, and I can go and do as I please without any reasons or expectations of me. I have not had many people clearly explain the situation, although a place called - Maradi - is the recurring name I hear of a city or region that has a problem. I was corrected last night by a woman from Boston who said, nobody would call this she says a Famine they would call it a -Food Crisis-. - What is a Food Crisis-? Food Crisis, is a general statement, I guess as I pushed along it mean there is a crisis with the food that has many problem. The number one problem is as best I can understand a malnourishment problem, hell asked her and I cannot tell you the problem. I can tell you that not all people are dying according to this person explanation, the people who are dying are the weak or unable to fend for themselves people. This means a child maybe between the ages of 2-5 or maybe 6 years of age, not breast feeding however not able to run around or scrounge around the place for food themselves, they need someone to help them survive. I also assume this means the sick or very old. Like a quick form of Darwinism where the week are culled from the pack quickly. I have discovered that this is probably a problem that happens once every three or four years and the government stockpiles food so they can give food out when there is a shortage. However, there must be some type of problem or reluctance this time for the government to help correctly. I was told and an I am trying to understand. Some Journalist are turned back at the airport if they have a large bunch of cameras or equipment with them. I have not met any Journalist yet, however I am not able to move around easily yet, the people here are very aggressive and will try to ask a lot of money and they push hard. I am not excited to travel around, however today I will take a few taxis around to various parts of the city. I have been told there are bank machines in the Guerre Hotel or something like that, I have to have someone write this word down, before I leave, at first it was thought to be in the Grand Hotel, some 100 dollars a night place and the one recommended in the Embassy of Niger in Cairo, wonder why nobody ever recommends a cheap place. I should go to the Grand Hotel and see who is checked into the place, probably the United Nations and for sure, I am cynical on how they live and contribute. I would say the need is for doctors that is my guess, people that are capable of diagnosing various life threatening problems. Malnourishment is not an easy thing to see or understand and is not something you can just look at a person and say, hmm.. They do not have enough protein, they need more Vitamin A, B, or C or something like that, the problem of bad nutrition are from a long-term lack of eating right food, not the short-term idea of eating only rice for a week. I do not understand and I have spent year reading as much as I can about malnourished people, I have only saw one place on the planet where I think they ate so badly for so long that they had hair that was dry, bleak, and brittle, that was on the River Napo between Coca, Ecuador an Iquitos, Peru. That is the only place I would say, these people need something. I do see many people that have this wide-eyed, mongoloid type forehead that I understand to be a problem from the mother being alcoholic while carrying the baby, this look is very common in the world. To me the lack of fast eyes, or a constant slowness of the brain functioning is a problem, I do not know what causes it and of course a slow person is a slow person that is how a slow persons brain functions however in some countries you feel as though there is slowness in the eyes that seem like the result of something undefined or not understood, like maybe there are chemicals in the water not know about. 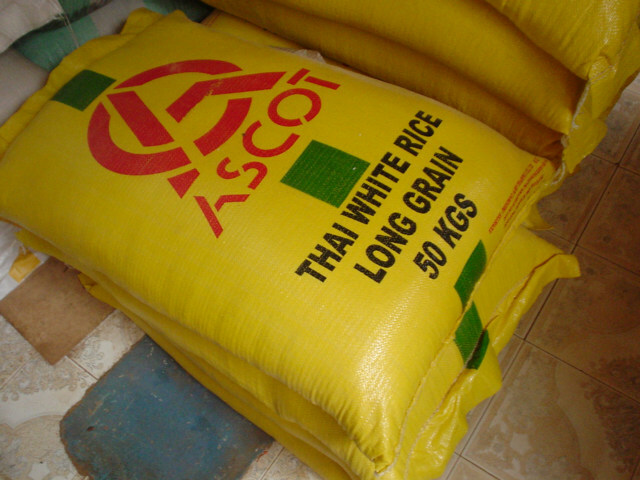 This is a large economy size bag of rice sold in the local store, there were maybe 30 of these bags or more in the local place, so there is food here for sale, however I need to discover the price. 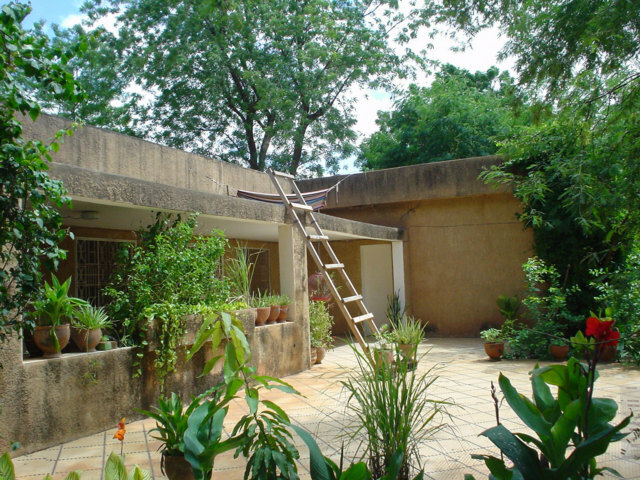 This is where I am living and for sure, I am living in luxury, my living quarters is great, nice front, we have guard at the entrance that jumps up and opens the gate or door every time I get near and are very friendly. This is three signs on the corner as I walked to the internet café yesterday, they are grouped in one spot and this is the first corners I reached. 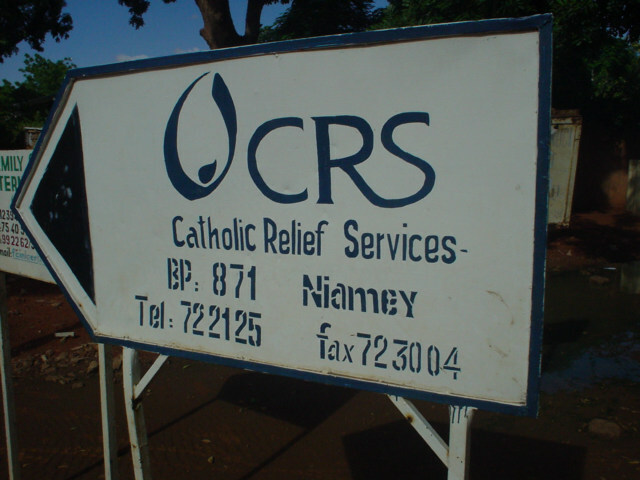 I guess this is Catholic Relief Services, I cannot be bothered to learn all the agencies or there is no need as I can see to learn or worry about the agencies here in Niger as it seem the whole world is here already. 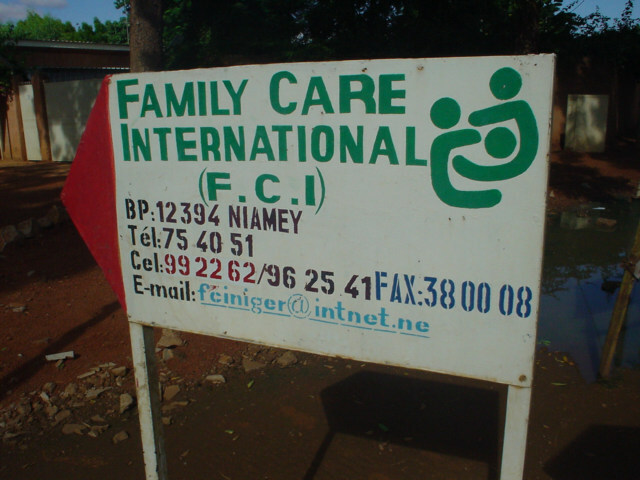 This is Family Care International, I am living in one of the neighborhoods that is considered fashionable or was one of the first nice neighborhoods built after the last big change in governments. I do not know what that means. 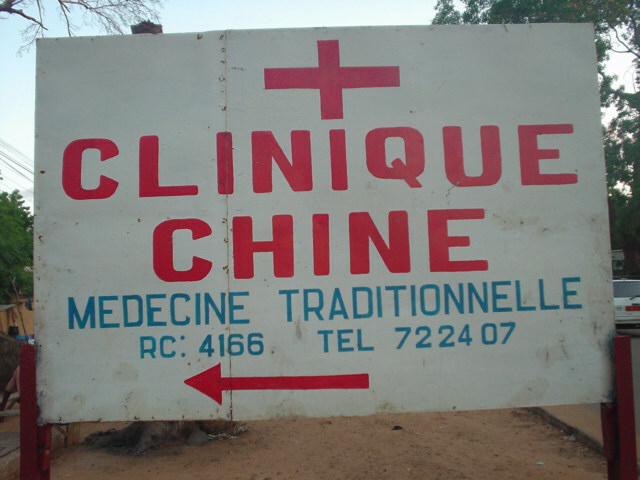 Chine or China I believe is represented, I do think there is nobody on the block that is not here out and about, I was told for sure that WorldVision.org I here and I am still waiting for a guy from this organization to write me back, it has now been about five days, and nothing. 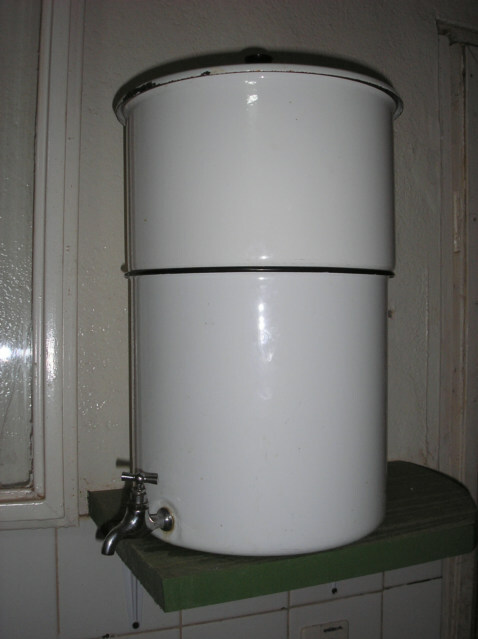 This is a drinking water filter, I am not sure how it works, I have seen this before, I am not sure I would trust, I better say, I do not trust this type of system, if I thought the water was bad, I would boil the water, this is more or less in my view a weak way of cleaning the water of small particles, I am not sure, the water taste ok here an I have now drank a few glasses from the tap as is my normal custom if the water taste ok, I did not drink the water in Cairo, Egypt much because of the large amount of Chlorine or some chemicals there in the water, the water here taste pretty good. I do drink a lot of coffee and this is one of my major sources of water for my body, not the best way, however it is lightly boiled or brought to small boil. I have been brushing my teeth and drinking the water, if it is bad maybe and I highly doubt it I will soon be sick… hehehe, do not worry, I am not sick. 10-20 percent of the Vehicle here are the 30-50,000 dollars Toyota Land Rovers or whatever the correct name is for these large cars, the are all driving around with some type of decals on the sides saying from what organization they are associated.